Boeing Co. continues to clamp down on the cost of building jetliners, boosting profits at the world’s largest aerospace company and on Wednesday driving its shares up nearly 10%. The company reported forecast-beating earnings for a fifth quarter in a row on Wednesday. It also lifted its full-year targets again as it boosts production from an order book of 5,700 aircraft and defense equipment worth almost $500 billion. Boeing has emerged from a long stretch beset by problems building new jets such as the 787 Dreamliner, with the smoother launch of new models and a focus on reducing expenses through a mix of thousands of job cuts and more efficient factories. It is also chasing a bigger share of the market for maintaining aircraft for airlines and military customers, a pursuit that has unsettled relations with some of the suppliers that are crucial to boosting output of its commercial jetliners. 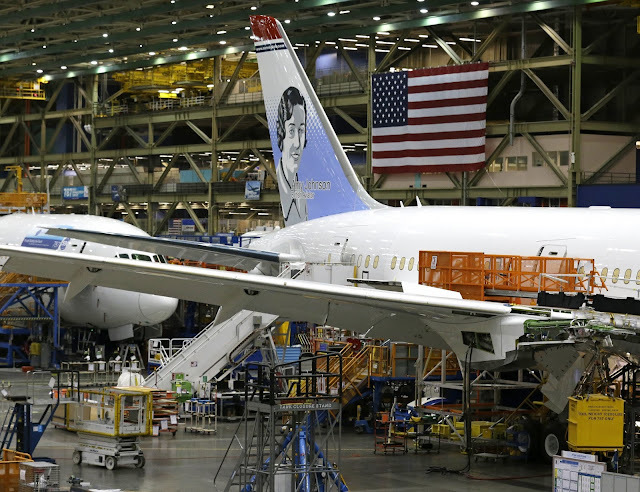 He said Boeing was keeping a close watch on the supply chain as it works to boost production of its 737 workhorse jet by more than a third over the next three years, countering slower sales of its larger widebody planes. The slimmer workforce and new manufacturing processes are also being used to test the potential for profitably building an all-new twin-aisle jet seating more than 200 passengers. Boeing shares have climbed by almost 50% this year as investors gain confidence that the rise in global airline passenger traffic will ensure that airlines follow through on all of the jet orders placed in recent years with the U.S. company and rival Airbus SE, which reports Thursday. The surge in Boeing’s stock Wednesday, up 9.9% at $233.45, made it the largest component in the Dow Jones Industrial Average, overtaking Goldman Sachs Group Inc.
Boeing’s cost-cutting efforts helped it generate more than twice as much free cash as analysts were expecting for the latest quarter, prompting a bump to planned stock buybacks. The company is also prepaying big pension commitments due over the next four years. Mr. Muilenburg said free cash flow is expected to rise year on year through the end of the decade. Boeing plans to lift stock buybacks to $10 billion this year and will return all of its free cash to shareholders in the form of repurchases and dividends. Boeing reported quarterly profit of $1.76 billion, or $2.89 a share, swinging from a year-earlier loss of $234 million that reflected charges on its commercial and military programs. Revenue fell to $22.74 billion from $24.76 billion, after Boeing delivered fewer jets as it transitioned to an upgraded version of the 737 and slowed output of its 777 jetliner. The company still expects to deliver 760 to 765 jetliners this year, and Mr. Muilenburg said plans to sell aircraft to airlines in Iran next year remain on track. Its order book rose to $482 billion. Boeing boosted its 2017 earnings guidance for the second time this year, adding 60 cents for a range of $9.80 to $10 a share. Its sales guidance was unchanged at $90.5 billion to $92.5 billion. —Ezequiel Minaya contributed to this article. The Guyana Civil Aviation Authority (GCAA) is preparing to launch an intensive probe into a plane crash at Eteringbang Tuesday afternoon that claimed the life of a Roraima Airways pilot- an incident that has plunged the domestic carrier into mourning. Dead is Chief Pilot, 39-year old Collin Martin who leaves to mourn his wife , Dr. Roberta Martin, and their eight year-old daughter. GCAA Director General, Retired Colonel Egbert Field said investigators would be inspecting the crash site early Wednesday morning. The Accident Investigation Group, an entity separate from the GCAA, is also expected to independently probe the incident and produce a preliminary report. Field said the investigation would include an autopsy, examination of the wreckage, interviews with the pilot of the other Roraima Airways plane and witnesses. “I don’t think we will be short of witnesses because anytime an aircraft is heard overhead, there is always a lot of people coming out to see – just to enjoy, to see the sight of an aircraft- so we shouldn’t have too many problems to find individuals who can be interviewed,” he told reporters. Already, the GCAA Director General has been able to ascertain from the other pilot that visibility was good. 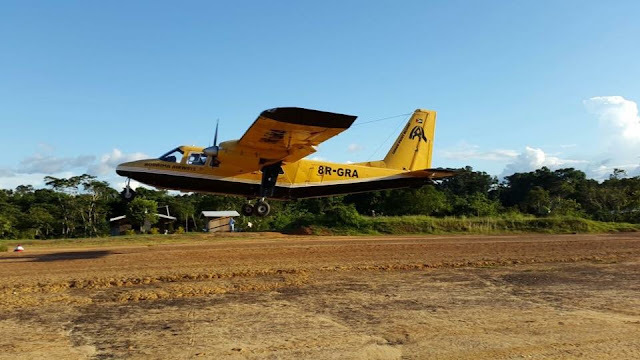 Chief Executive Officer of the Roraima Group of Companies, Captain Gerry Gouveia said the incident was now in the hands of civil aviation investigators, but so far the plane, bearing registration number 8R-GRA, and another Roraima Airways plane left Ekereku and were about to land at Eteringbang to overnight when the incident occurred. The planes and crew are covered by the relevant insurances, he said. “The only report that we have so far is that the aircraft was closing off its operations for the day. It was empty, the pilot was flying alone and going into land when the aircraft crashed. We don’t have any indication at this time- the reason it happened,” Gouveia told reporters. Sources said the plane went down at approximately 5:48 PM about 200 metres on the approach to the Eteringbang airstrip. The CEO hailed Captain Martin as an “experienced and wonderful pilot” who was working with the domestic carrier for at least six years during which time he emerged as “out star evacuation pilot”,sacrificing his life to save many lives. “He is a great loss to Roraima. The entire Roraima team is very, very shaken at the moment,” he said of the former Guyana Defence Force (GDF) Major who served in the Special Forces. As the news of the passing of Martin spread, many of his colleagues and friends flocked the Roraima Airways operations office at the Eugene F. Correia ‘Ogle’ Airport to express their condolences to his wife, Dr. Roberta Martin, and family as well as Roraima Airways staff. After medical personnel pronounced Martin dead at the Roraima Airways hangar, his body was removed from another Roraima Airways plane and placed into a waiting hearse. Dr. Martin is a lecturer at the University of Guyana and the doctor-in-charge at the Kitty Health Centre. 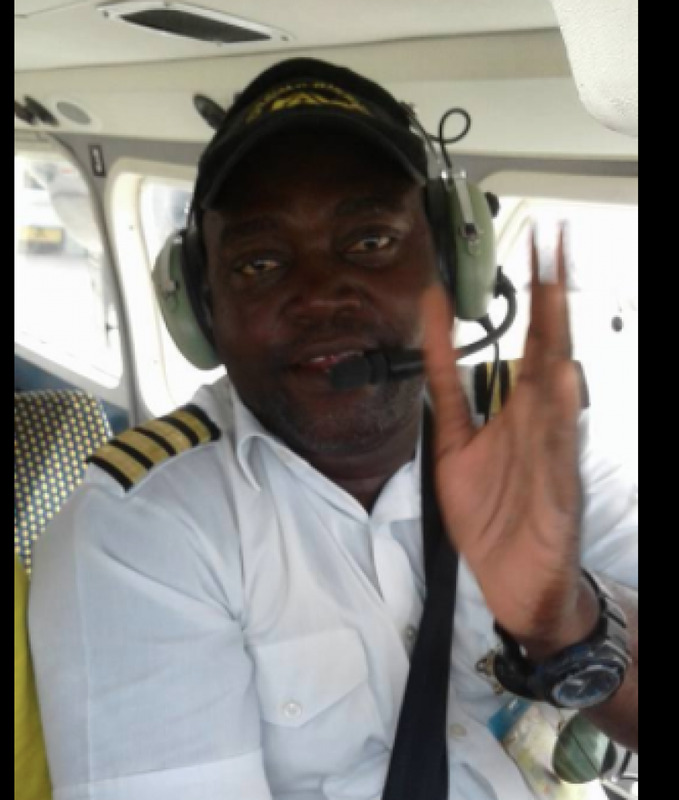 RORAIMA Airways pilot, Colin Martin, perished on Tuesday afternoon after the Britten -Norman island aircraft he was operating crashed on landing at Eteringbang, in Region Seven (Cuyuni/Mazaruni). Reports are that Captain Martin who was alone at the time was approaching the runway at the border location when he lost control of the aircraft bearing registration 8R-GRA. Police Divisional Commander, Rabindradath Budhram told the Guyana Chronicle that the man’s motionless body was retrieved from the aircraft and flown to the city Tuesday night. Aviation sources said that the pilot was shuttling between Eteringbang and other airstrips on Tuesday. 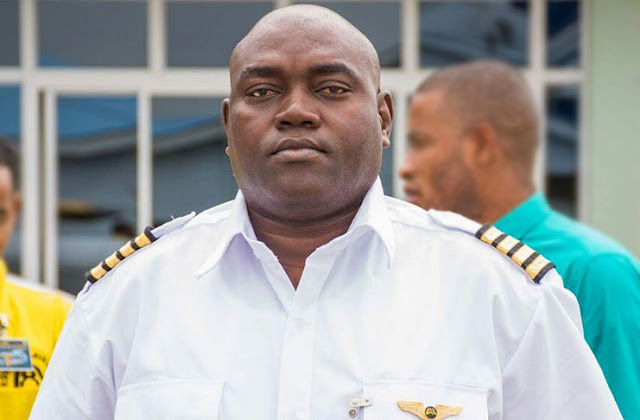 Captain Martin, who served the Guyana Defence Force (GDF) in the past, has been described by colleagues as one of the hardworking pilots at Roraima. He was credited with undertaking a number of medical evacuation flights from the hinterland. He is survived by his wife and daughter. In August 2016, the same aircraft which was involved in Tuesday’s incident sustained substantial damage after it encountered mechanical problems during takeoff at Eteringbang. The pilot lost control of the aircraft at the time and later crashed in a valley during an aborted take-off attempt. He escaped unhurt. Roraima Airways has been plunged into mourning after an afternoon plane crash claimed the life of the airline’s Chief Pilot, Captain Collin Martin. The crash of the Roraima Airways Islander aircraft took place just before sunset this afternoon. News Source understands that Martin was the only person in the aircraft during a regular shuttle flight into the Eteringbang community. Another Roraima Airways plane was flying on the same mission and it was the pilot of that plane that reportedly noticed the crashed aircraft. The man’s body has been recovered from the wreckage and efforts are being made to transfer the body to the city. In a Facebook post just moments after reports of the crash surfaced, Roraima Airways Managing Director, Captain Gouveia remarked “My Dear God”. He would later tell media operatives that Captain Martin was a dedicated and loved pilot who was committed to the job and went beyond the call of duty whenever an emergency arose. Shocked Roraima Airways staffers have been left in tears as they try to figure out what went wrong. Captain Martin was one of the most experienced pilots with the airline who completed dozens of flights daily to all parts of Guyana. He was one of the pilots who led medivac operations during the nights and was also a former Officer of the Guyana Defence Force. The Guyana Civil Aviation Authority has launched an investigation. 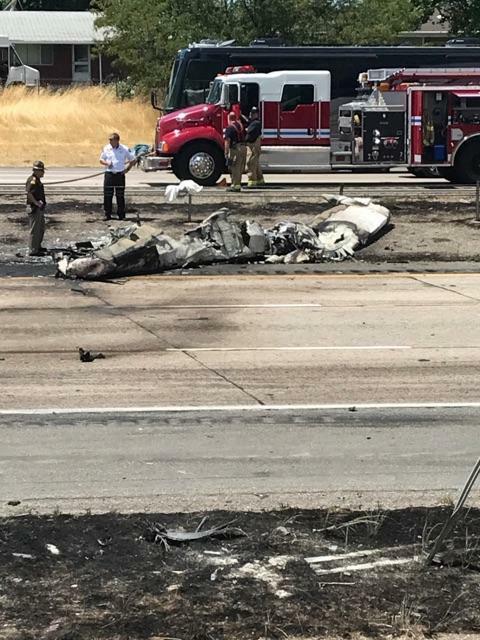 On July 26, 2017, about 1240 mountain daylight time, a Beech A36TC airplane, N60WB, was substantially damaged when it collided with the freeway shortly after departing from Ogden-Hinckley Airport (OGD), Ogden, Utah. The private pilot, and three passengers were fatally injured. The airplane was registered to Peak 2 Peak, LLC., and operated by the pilot as a 14 Code of Federal Regulations Part 91 personal flight. Visual meteorological conditions prevailed and a flight plan was not filed. The flight was destined for Yellowstone Airport (WYS), West Yellowstone, Montana. According to an air traffic control recording from the OGD tower, shortly after departing the runway, the pilot reported "hey, I'm going down, zero-whiskey-bravo." The controller cleared the pilot for landing and four seconds later, another pilot flying in the area reported seeing the airplane impact the highway. Witnesses who were also general aviation mechanics, located between hangar rows adjacent to the runway at OGD, heard the airplane during its departure. They stated that the sound was unusual which made them look up to see what it was. When the airplane first came into view they stated it was about 100 ft above the ground, and that it should be about 500 feet or higher at that location [which was about 3,700 ft down runway 17]. As the airplane passed by, they noticed the engine sound was underpowered and the tail of the airplane going up and down, as if the pilot was struggling to keep the airplane at altitude. Dash Cam video from a car on a southwest-bound street, captured the accident airplane in flight. The airplane was first observed flying wings level from the right side of the video frame. As it approached the center of the video frame, it entered a right turn and flew away, paralleling the street. Shortly after, the airplane entered a descending right banking turn until out of view. The accident site revealed that the first identified point of contact (FIPC) was the outer edge of the northbound freeway, and came to rest in the median, along the guardrail. 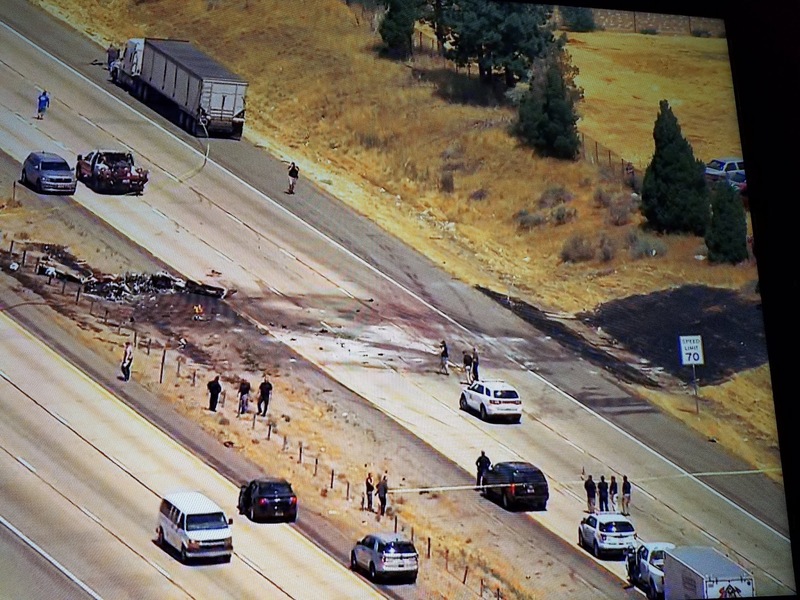 The debris field was about 150 feet long with debris in both north and southbound lanes. The main wreckage remained intact with post-crash fire damage. The wing tip tanks and the leading edge of the wings were crushed, consistent with vertical impact damage. All flight controls were accounted for and flight control continuity was attained. 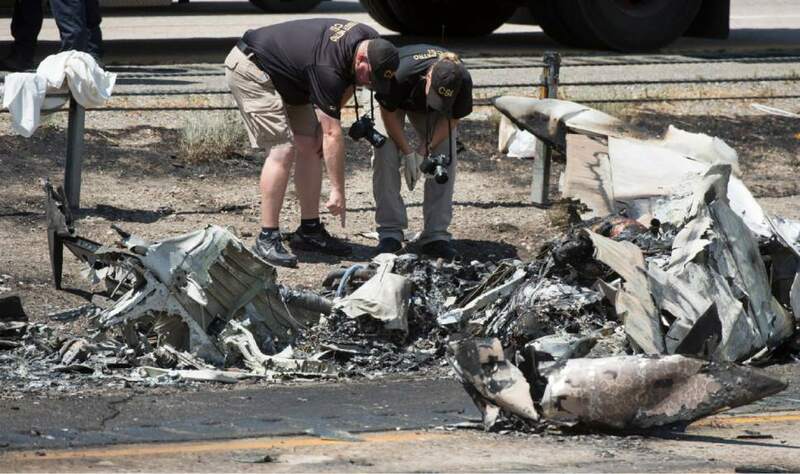 The propeller assembly separated from the engine during the accident sequence and was subsequently relocated about 200 feet further up the freeway from the debris field, after being impacted by a passing tractor trailer. No other vehicles were involved in the accident sequence. 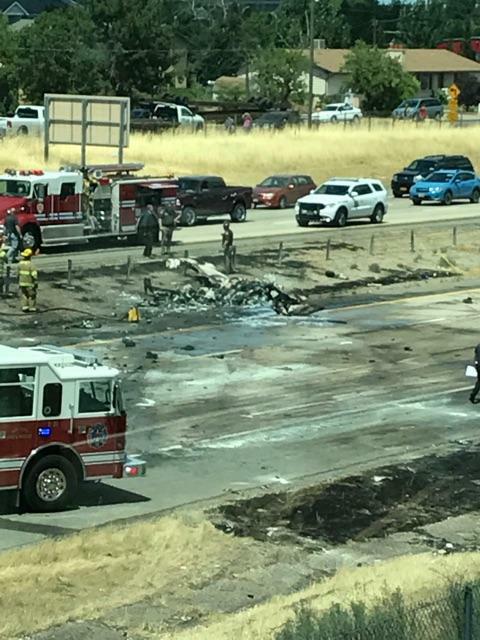 A small plane crashed on a Utah highway Wednesday, killing two couples heading for a vacation but narrowly missing cars when it barreled across the lanes through a gap in traffic. 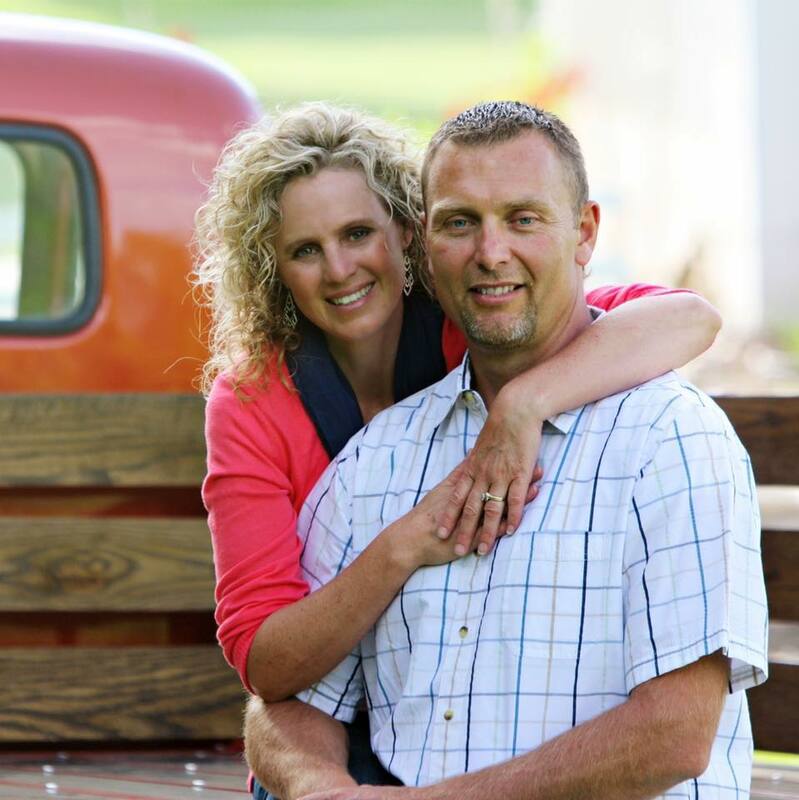 Layne Clarke, 48, was flying his wife and two friends as they departed for a vacation, said family friend and colleague Jeff Henderson. Clarke owned an automotive paint business and had gotten his pilot's license about five years ago after a friend got him interested in aviation, he said. Clarke was a "very energetic, wonderful man," Henderson said. "Out of nowhere from the east side, a plane came swooping in and just nose-dived into the middle of the freeway," Demetropolis told the newspaper. "It exploded. The flames engulfed the entire street." 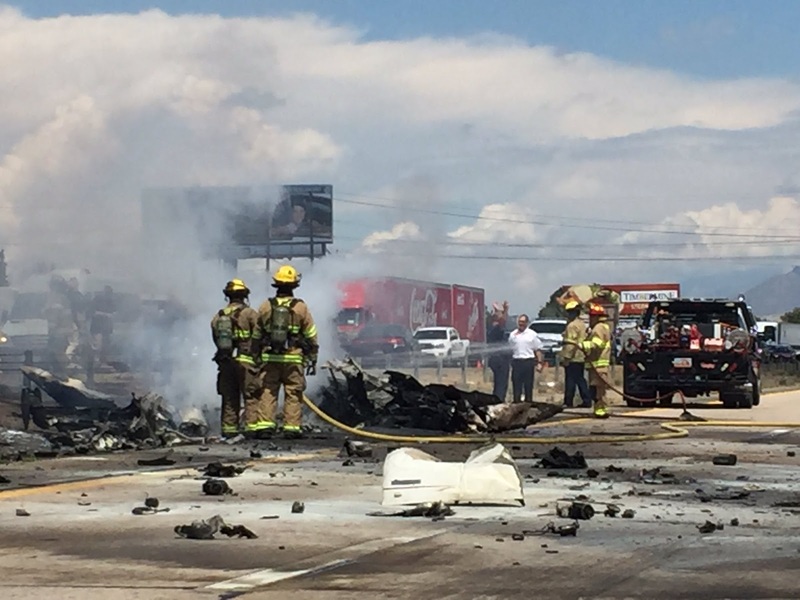 RIVERDALE — Two couples were killed when a plane crashed on Interstate 15 Wednesday. 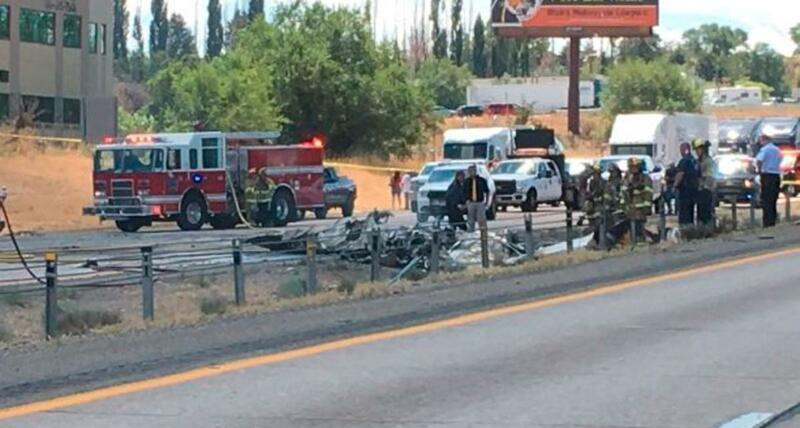 The Utah Highway Patrol identified the victims of the crash as Perry Huffaker, 45, and Sarah Huffaker, 42, of West Haven, and Layne Clarke, 48, and Diana Clarke, 45, of Taylor. At 12:40 p.m. Wednesday, a small Beech A36 Bonanza plane crashed on the interstate’s eastern edge, went across the northbound lanes and settled in the median, Utah Highway Patrol Sgt. Todd Royce said. 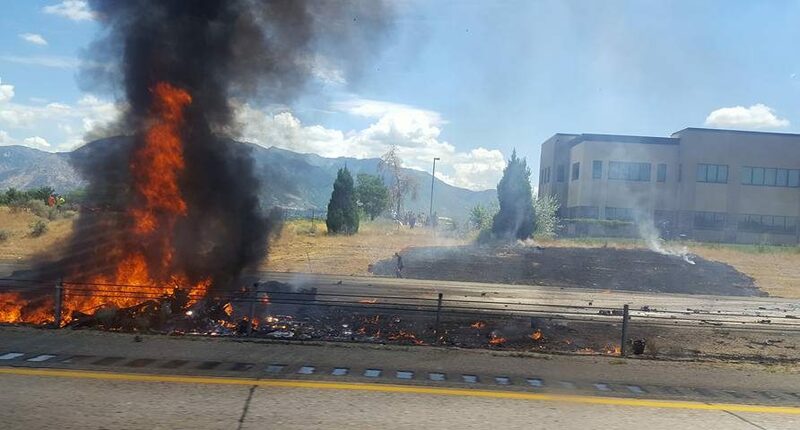 The plane had departed from Ogden-Hinckley Airport on Runway 17 and crashed about a half a mile away from the airport, according to Allen Kenitzer, public information officer for the Federal Aviation Administration’s northwest mountain region. The Huffakers and Clarkes died on impact, Royce said. They were headed to Island Park, Idaho, for a vacation. Layne Clarke is believed to have been piloting the plane at the time of the crash, Royce said. 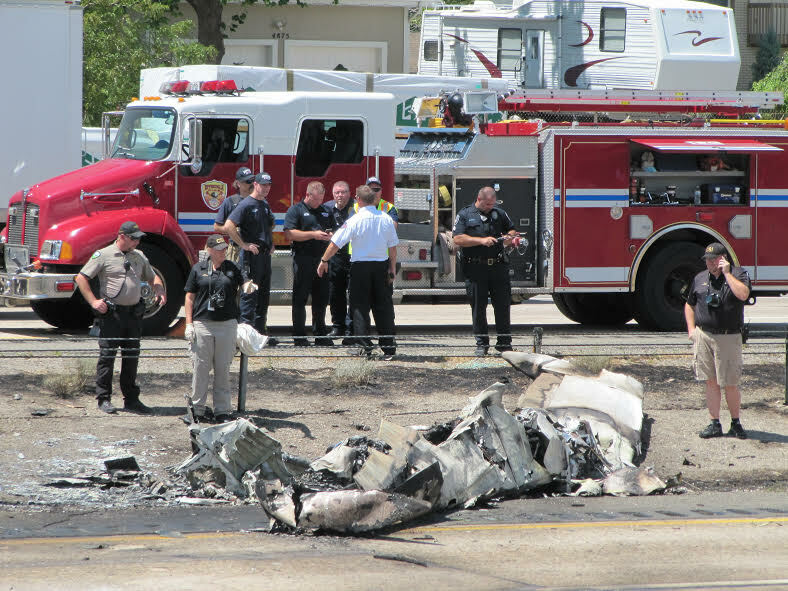 Witnesses said the plane exploded, and Royce said it caught fire in the median. 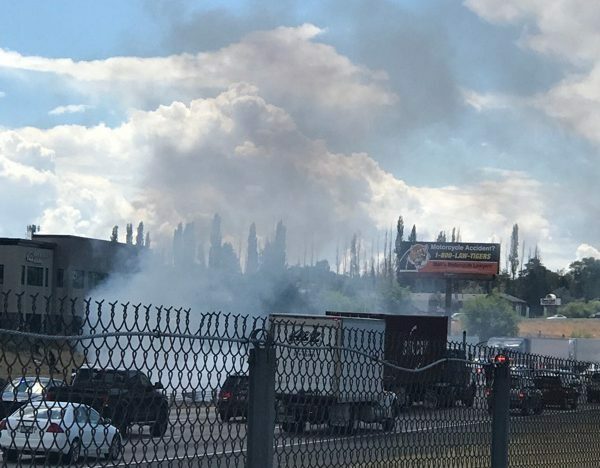 As the smoke and flames began to clear, charred pieces of the aircraft were scattered across the road’s northbound lanes. 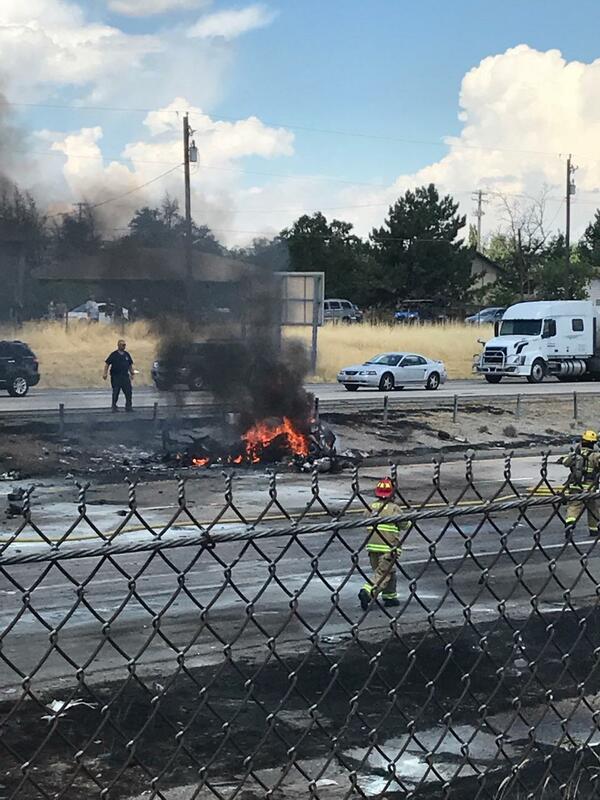 Though it crashed into multiple lanes of traffic, the plane — which was traveling west after leaving Ogden-Hinckley Airport — didn’t hit any vehicles. “Miraculously at the time, it seemed there was just a gap in the vehicles where it hit and came across ... no other injuries sustained besides the four fatalities,” Royce said. Northbound I-15 will be closed at Riverdale Road until 7 p.m. at the earliest, according to Vic Saunders, Utah Department of Transportation Region 1 spokesman. One lane of southbound I-15 is also closed in the area and heavy congestion starts around 31st Street. 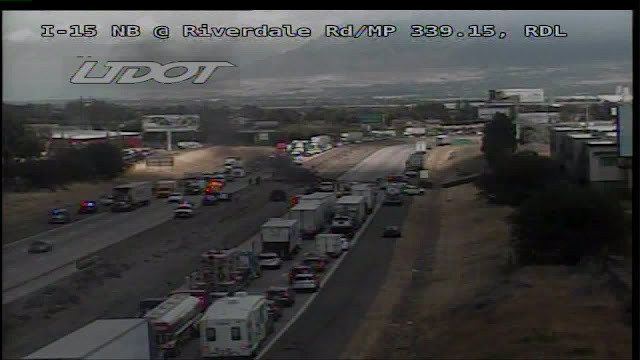 RIVERDALE — Four people are reported dead after a small plane crashed onto I-15 in Riverdale on Wednesday, snarling freeway traffic. 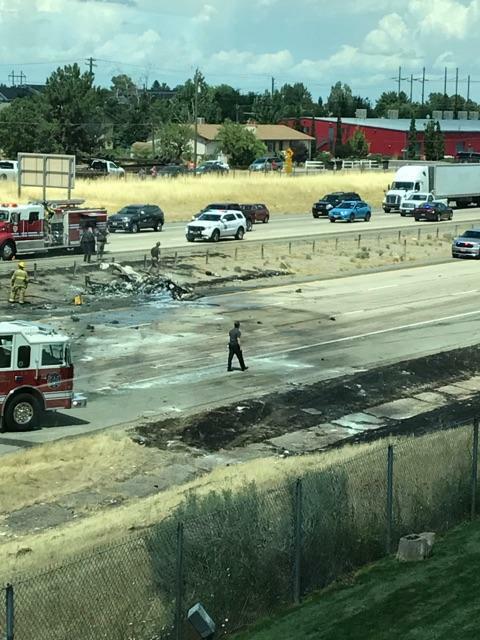 The Utah Department of Public Safety confirmed the crash shortly before 1 p.m. The department said four casualties have been reported in the crash. The Federal Aviation Administration reported the Beech A36 Bonanza took off from Ogden-Hinckley Airport, then crashed a half-mile away for unknown reasons. 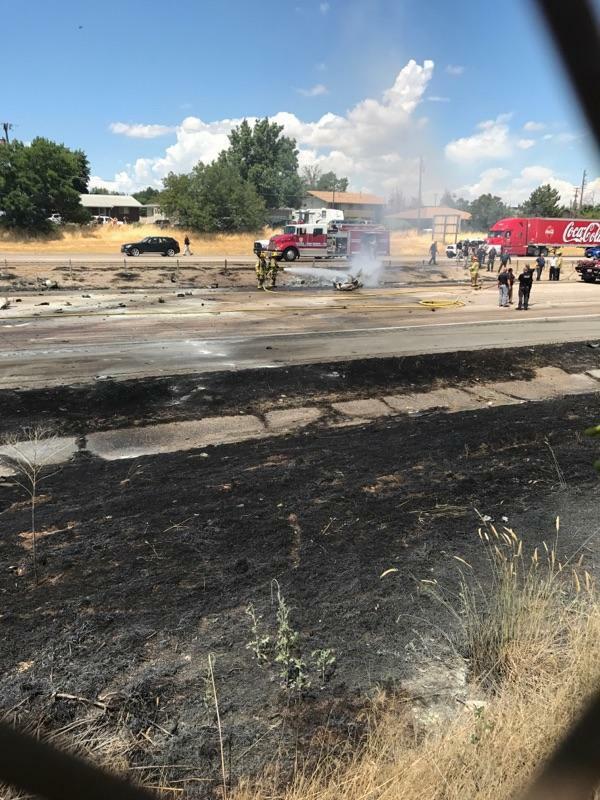 All northbound lanes were closed, and southbound traffic was down to two lanes as crews responded, police said, warning that significant delays are expected throughout the afternoon. "The kid in front of me … he pulled over in front of me as I pulled over further behind him, he jumped and ran, and he was already on his cellphone," Demetropolis said. "It was full force. It didn't look like anyone trying to slow down or anything. It was just a full nose dive straight into the ground," she said. 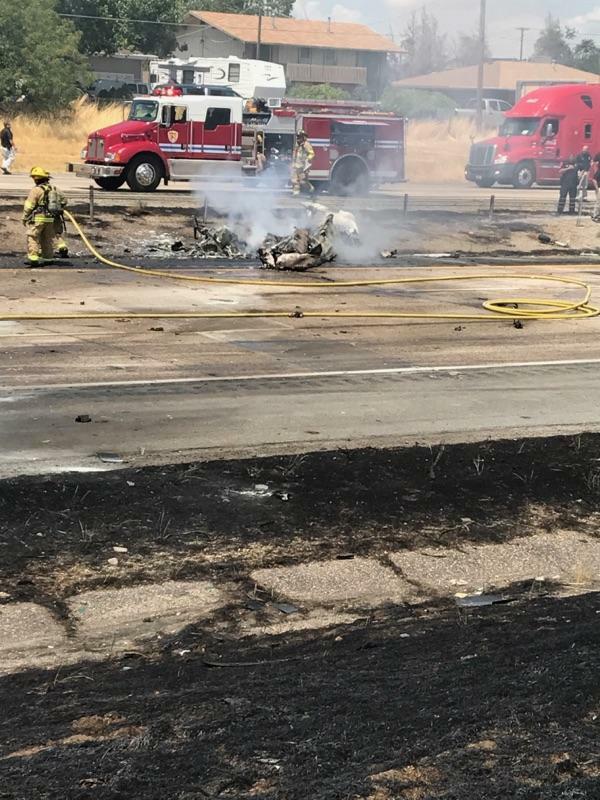 RIVERDALE — Four people are dead after a small plane crash that happened along Interstate 15 near the Riverdale Road exit Wednesday. 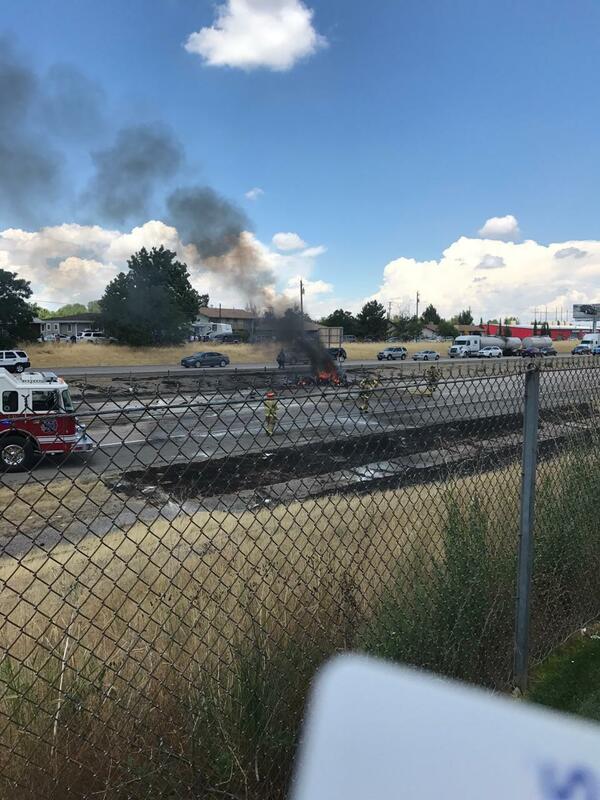 Weber County emergency dispatchers confirmed a small airplane crashed on the interstate’s northbound side, mostly in the median, at about 12:40 p.m. Wednesday. All northbound lanes were closed, and only one southbound lane was open, according to Utah Public Safety. Drivers should expect significant delays throughout the afternoon. Allen Kenitzer, public information officer for the Federal Aviation Administration’s northwest mountain region, confirmed that there were four passengers on the plane at the time of the crash. 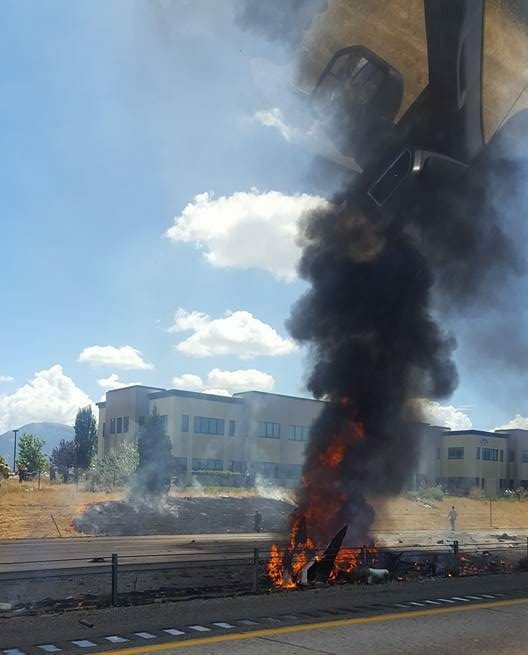 The Utah Division of Public Safety confirmed that all four passengers on board died in the crash. It is unknown as of 2:30 p.m. what caused this plane crash. Reached by telephone, Ogden-Hinckley Airport general manager Jon Greiner said he’s out of town and didn’t have much information other than what he was told in a phone call about 12:45 p.m.
Mark Kendell, Ogden Hinckley Airport Advisory Committee chairman, was out of state and said he hadn’t heard about the crash. 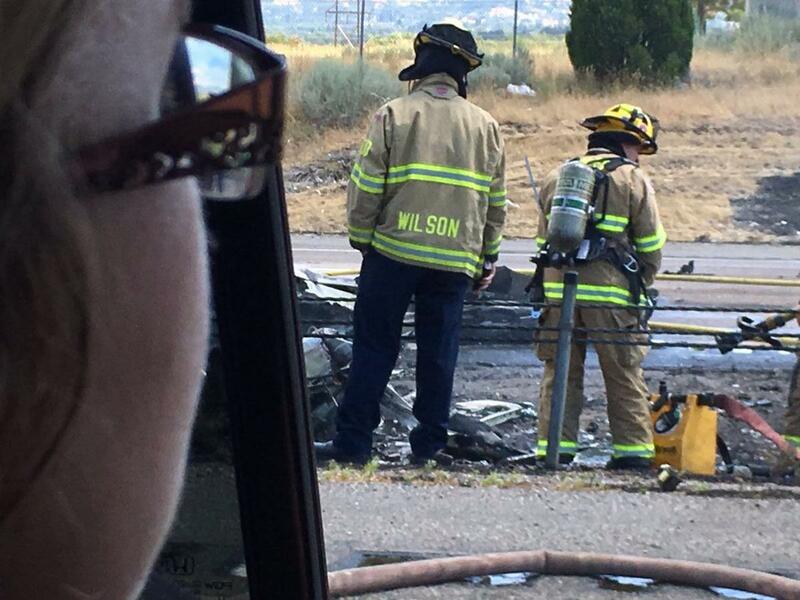 A worker at the Ogden airport’s control tower was unable to comment on the plane crash. 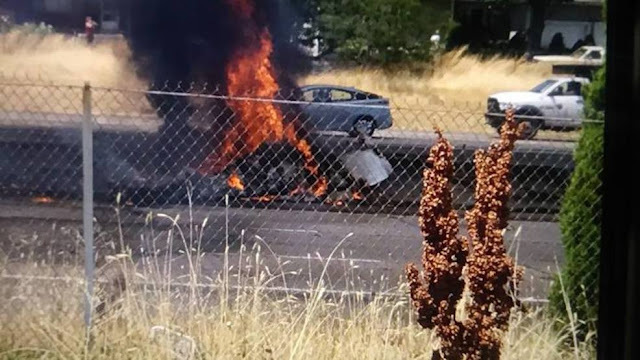 It was unclear whether any cars were involved in the crash as of 1:25 p.m. It was also unclear who the plane belonged to or where it was going. Obdulio Ruiz, a truck driver from Los Angeles, was at the scene of the crash and said he saw the plane go down. 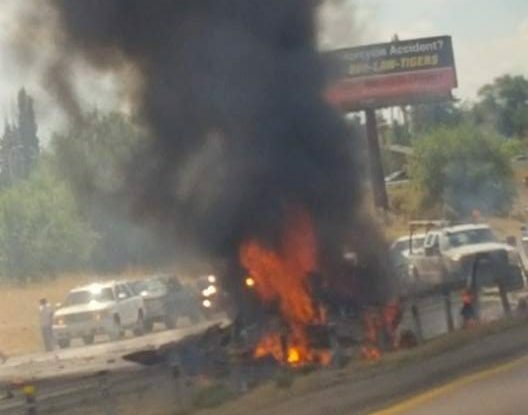 Ruiz said the plane looked like it was out of control before it crashed in front of his semi-trailer. 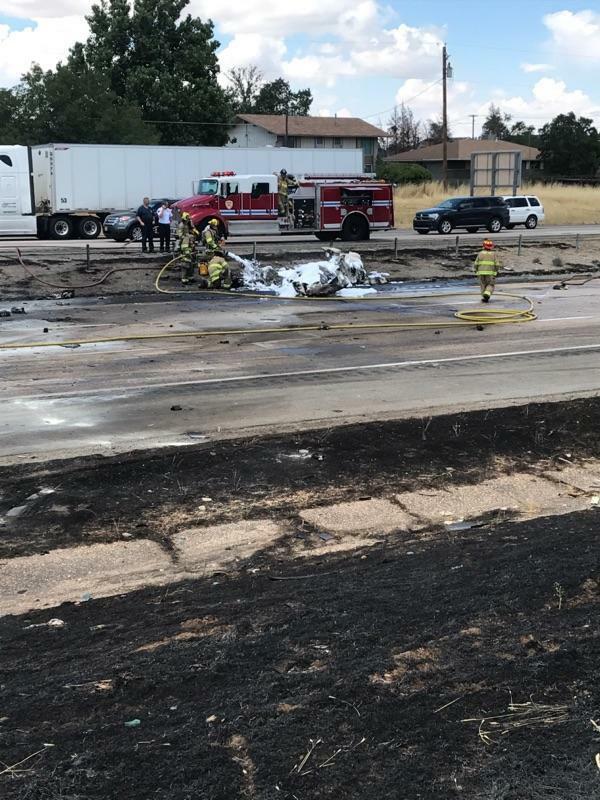 Ruiz, who was driving a truck full of flammable chemicals, said it looked like the plane attempted to land on the interstate but was unable to. 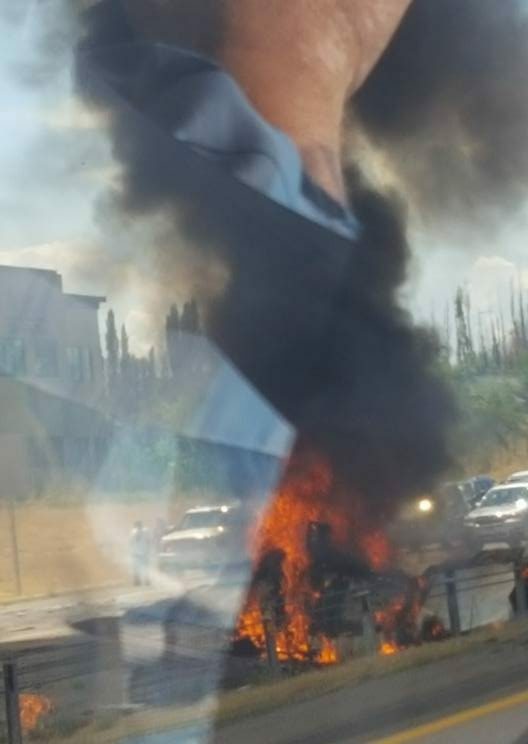 Kat Yoder, who was in a nearby parking lot when the plane crashed, said there was an immediate explosion but she didn’t see any vehicles involved. 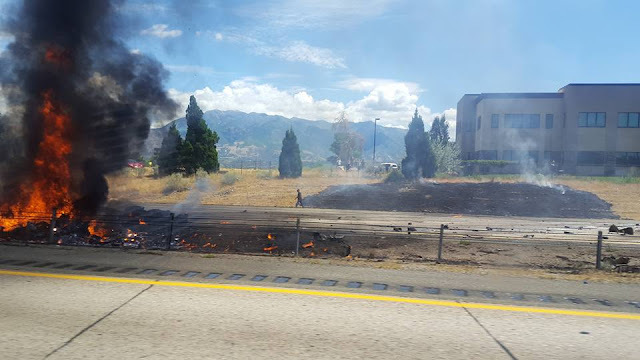 WEBER COUNTY, Utah - Four people died Wednesday afternoon when a small plane crashed on I-15 in Weber County. The victims have been identified as Layne and Diana Clarke of Taylor, Utah, and Perry and Sarah Huffaker of West Haven, Utah. The crash happened shortly before 1 p.m. near 5600 S.
Sgt. Todd Royce of the Utah Highway Patrol said the plane is believed to have taken off from Ogden-Hinckley Airport and was destined for Island Park, Idaho. Utah Highway Patrol troopers closed all of I-15's northbound lanes and all but one southbound lane in the area. "I-15, if you can think about it, is our most heavily-traveled interstate in Utah. And to shut this down, northbound, during the evening commute, that's going to cause considerable inconvenience for a lot of folks," said Utah Department of Transportation spokesman John Gleason. Gleason suggested using US-89 or, for those traveling from the Salt Lake City area, going up Parleys Canyon and back down Ogden Canyon. "That's a long detour, but you may actually make your destination a little sooner than you would if you chance coming up here on I-15," Gleason said. No cars were involved in the crash. "We're here in Weber County, three lane interstate. It's usually very busy. It's actually pretty miraculous that no one got hit that was traveling in there," said Sgt. Todd Royce, UHP. Federal Aviation Administration and National Transportation Security Board officials will be at the scene to conduct an investigation of the plane crash. Utah Highway Patrol and State Bureau of Investigation officials are also documenting the crash. "We just want people to know, especially those that are caught in traffic, that this takes some time and please be patient," Royce said. Due to the ongoing investigation, it's unclear when the freeway will reopen. The NTSB confirmed the plane was a Beech A36TC Bonanza. The search for a possibly downed plane in Nash County is over. N.C. Highway Patrol 1st Sgt. 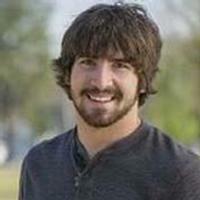 Jimmie Silver and Nash County Sheriff Keith Stone both confirmed late Wednesday morning that the search was called off after officials combed the area for two hours. Stone said the plane had reportedly been spotted flying near Middlesex late Tuesday evening. The search was being coordinated by the Nash County Sheriff’s Office, N.C. Highway Patrol, Civil Air Patrol and the National Guard. 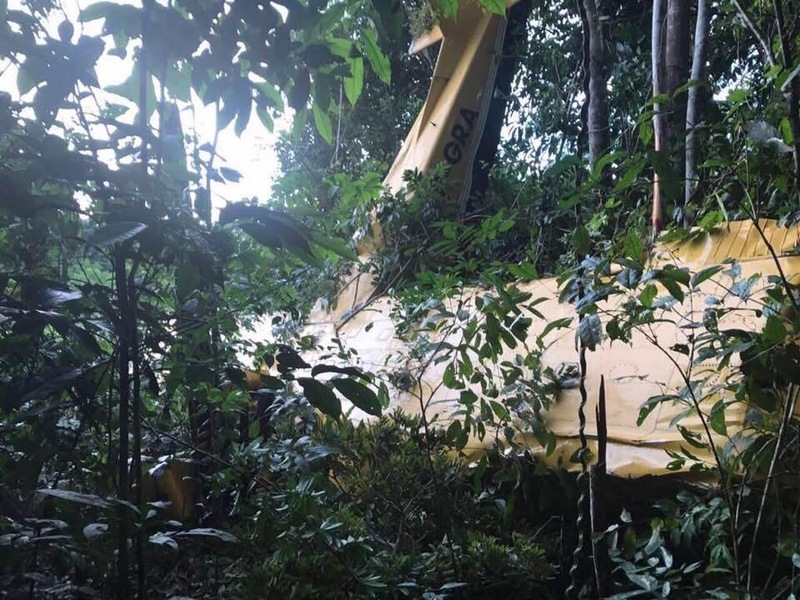 Silver said a Highway Patrol helicopter that was making flyovers Wednesday morning around the area where the plane was believed to have been seen was not part of the search operation for the missing plane, but part of an ongoing drug investigation. Nash County sheriff’s deputies responded to a call about a plane in distress at 6:45 p.m., according to a press release. Emergency officials in the area reported smelling an odor they believed could have been jet fuel; however, officials could not confirm the source of the odor. Residents in the Middlesex area reported seeing and hearing the plane believed to have sent the distress call, according to the release. Rocky Mount-Wilson Airport officials said Wednesday they received no reports of planes missing landing times, and no planes had been reported damaged. Officials at Ball Airport in Louisburg, Wilson Industrial Air Park in Wilson and Tarboro-Edgecombe County Airport reported the same. Attempts to reach officials at Double S. Airport in Red Oak and Raleigh-Durham International Airport for comment were unsuccessful as of presstime. MIDDLESEX, N.C. — Authorities have suspended the search for a plane that reportedly crashed Tuesday night in Nash County. Authorities searched on foot and by helicopter, but were unable to located a plane after two hours. Investigators said they will resume the search Wednesday if they receive a report of an overdue plane or if wreckage is spotted. According to the Nash County Sheriff's Office, an air traffic controller from Washington, D.C. received a call from a pilot who had picked up a distress signal from the plane in Nash County. That air traffic controller then called 911 to alert local authorities. The Nash County Sheriff's Office said that fire crews were sent out to the area of N.C. Highway 231 in Middlesex at about 6:45 p.m. and fire and EMS personnel reported smelling a strong odor that was possibly aviation fuel. Two nearby residents told deputies that they heard a plane while a child told deputies they saw the plane. One investigator said a witness reported seeing a plane make "a sharp right turn that looked out of control." 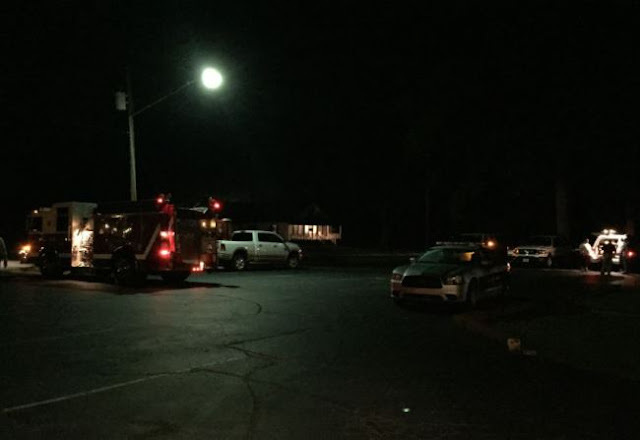 Local authorities worked with Civil Air Patrol and the National Guard to search the area Tuesday night. MIDDLESEX, N.C. (WNCN) — The search for a possible downed place in Nash County was called off around 10 p.m. Tuesday and will not be resumed Wednesday, the Nash County Sheriff’s Office confirmed. Capt. Eddie Moore told CBS North Carolina that an airplane from the Civil Air Patrol flew over the area and nothing was located and they have found no information that shows an airplane actually crashed. 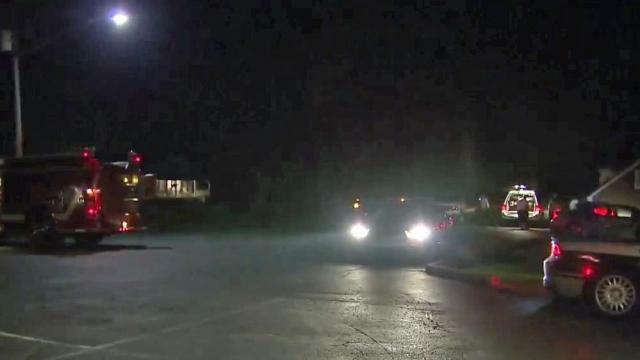 MIDDLESEX, N.C. (WNCN) — Crews in Nash County searched for a possible downed plane for several hours Tuesday night after officials reported a distress signal, officials said. The incident was reported around 6:45 p.m. Tuesday when air traffic control officials in Washington, D.C. told Nash County authorities that a plane was picking up a distress signal in the Middlesex area, the Nash County Sheriff’s Office said. When deputies got to the area of N.C. Highway 231 and Buck Deans Road they could smell an odor similar to aviation fuel. Two people in the area also reported “hearing” a plane and a child saw a plane, officials said. Later Tuesday night, the Civil Air Patrol flew over the area and did not pick up any sort of signal, officials said. Just before 10 p.m., authorities decided to end the search for the night. Authorities will reassess the situation Wednesday morning to see if a search will be continued in day-time hours. The North Carolina State Highway Patrol assisted in the search. Aircraft hit a sign while taxiing. The pilot reported that windy conditions existed during the flight, but the wind was not a crosswind during landing. He said that the airplane touched down hard on the nosewheel, bounced, and then settled onto the runway. Postaccident examination of the airplane revealed that the nosewheel landing gear and propeller were bent, and the firewall sustained substantial damage. The pilot reported no mechanical malfunctions or failures that would have precluded normal operation. The pilot’s inadequate flare, which resulted in a hard nosewheel landing. Aircraft aborted take off while doing touch and goes then reported a flat tire later on. Airport operations reported several runway lights out and found foreign object debris on the runway. National Transportation Safety Board determined there was minor damage to the aircraft. On July 25, 2017, about 1310 Pacific daylight time, a Lake LA-4, N7628L, was substantially damaged after veering off the runway during landing at the Byron Airport, Byron, California. The airplane was registered to Aerial Surveys Inc., and operated by the pilot as a 14 Code of Federal Regulations Part 91 local personal flight. The private pilot and passenger were not injured. Visual meteorological conditions prevailed and a flight plan was not filed. The flight originated from Livermore Municipal Airport (LVK), Livermore, California at an unknown time. The pilot reported to a Federal Aviation Administration (FAA) inspector that during landing, the nose landing gear collapsed forward and the airplane veered right off the runway, collapsing the right main landing gear. A postaccident examination of the airplane revealed wrinkling of the right wing upper surface and damage to the keel. Aircraft taxied off the hard surface into the grass and the nose gear collapsed. Aircraft porpoised while doing touch and goes causing the nose gear to bend and a prop strike. The airplane impacted trees and terrain while on approach to land on a privately-owned grass runway. There were no witnesses to the accident. The airplane came to rest about 2,100 ft from the approach end of runway 24 and about 250 ft left of the extended runway centerline. The accident site was located about where the turn from a left base leg to final approach for landing on runway 24 would be made. Examination of the wreckage indicated that the airplane initially struck trees with its left wing and then impacted the ground in a nose-low attitude. The airplane's close proximity to the initial tree impact, and the attitude at which it struck the ground indicated that the airplane had little forward velocity. Examination of the airplane, its control systems, and engine did not reveal any preimpact anomalies. Based on the available evidence, it is likely that the pilot did not maintain adequate airspeed during the turn from the base leg to final approach, which resulted in the airplane exceeding its critical angle of attack and an aerodynamic stall at a low altitude. The pilot's failure to maintain sufficient airspeed during the landing approach, which resulted in exceedance of the airplane's critical angle of attack and an aerodynamic stall. On October 28, 2016, about 1845 central daylight time, an Aviat A-1C-180, N377MA, was destroyed when it impacted trees and terrain while on approach to land at a private airstrip near Clarksville, Texas. The pilot, who was the sole occupant, was fatally injured. The aircraft was registered to ACME Husky, LLC, and operated by the pilot under the provisions of 14 Code of Federal Regulations Part 91 as a personal flight. Visual meteorological conditions prevailed for the flight, and a flight plan was not filed. The flight originated from McCurtain County Regional Airport (4O4), Idabel, Oklahoma, at an undetermined time. The pilot was landing at the private strip to meet his girlfriend and her family. The pilot performed a fly-by of the lodge adjacent to the strip before circling around to land on the runway. The pilot's girlfriend witnessed the fly-by, but did not witness the accident. When the pilot didn't land and come to the lodge, a search was started and the airplane was found that evening. The pilot, age 24, held a private pilot certificate with airplane single-engine land and instrument airplane ratings. A review of the pilot's flight records revealed that he had accumulated about 614 hours of total flight experience, including 447.9 hours in the accident airplane. The most recent flight review recorded in the pilot's logbook was completed on June 23, 2014. The pilot's family owned the lodge and airstrip where the accident occurred. His logbook did not list flights into or out of the private strip, however, much of the flight time recorded in the accident airplane was recorded as "block time" with no departure or destination points listed. The pilot held a third-class medical certificate issued on July 17, 2012. The medical certificate listed no limitations. Based on the pilot's age, the medical certificate was valid until July 31, 2017. The airplane was a 2008 Aviat A-1C-180 "Husky," serial number 3005. It had seating for two in a tandem arrangement and was a high-wing, strut-braced fabric-covered monoplane. The fuselage structure was predominately welded steel tubing, and the wing structure was aluminum. The airplane had a conventional (tail-dragger) landing gear and was equipped with oversize "tundra" tires. The airplane was powered by a Lycoming O-360-A1P engine, serial number L-41066-36E. The engine was rated to produce 180-horsepower and powered a 2-blade MT Propellers constant speed propeller. Maintenance records showed that the airplane's most recent annual inspection was completed on January 5, 2016. At the time of the annual inspection, the airplane had accumulated 706.8 total hours in service. The recording hour meter reading at the accident site was 741.7 hours. At 1835, the weather conditions at 4O4, about 11 nautical miles north of the accident site, were: wind 170° at 5 knots, 10 miles visibility, clear skies, temperature 23°C, dew point 12°C, and altimeter setting 30.12 inches of mercury. Sunset on the day of the accident was at 1830, and the end of civil twilight was at 1855. The airstrip's grass runway was oriented about 60°/240° and measured about 2,900 ft in length and 75 ft in width. 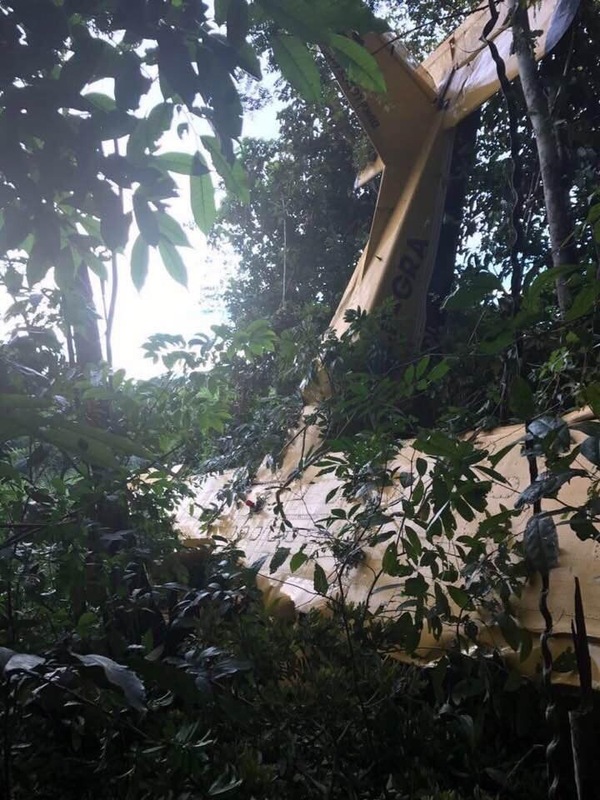 The airplane came to rest in a wooded area about 2,100 ft from the approach end of runway 24 and about 250 ft left of the extended runway centerline. This location was about where a normal turn from a left base leg to final approach for landing on runway 24 would be made. There were multiple branches broken from trees southeast of the main wreckage, indicating that the airplane's direction of travel at the time of impact was about 330°, consistent with the heading of a left base leg for runway 24. The base of the tree that was first struck was about 50 ft from the main wreckage. The airplane's fuselage was oriented on a heading of 135° and was predominately intact with crush damage to the forward end. The crush angle of the lower forward fuselage was consistent with a steep nose-down impact angle. The aft fuselage was intact with no apparent damage to the structure aft of the cabin. The vertical stabilizer, rudder, horizontal stabilizer, and elevator remained attached to the fuselage and were intact. The right wing was predominately intact with denting of the entire leading edge and aft crushing of the outboard leading edge near the wing tip. The wing spars remained attached to the fuselage structure. The aileron and flap remained attached to the wing structure. The fuel tank was breached; however, a portion of the tank still contained an unknown quantity of fuel. Both wing struts were bent but remained attached at both ends. The left wing was structurally separated from the fuselage and remained attached by one aileron cable and the flap control cable. The wing came to rest in an inverted position next to the fuselage. The wing spar attachment bolts were still in place on the fuselage. The forward and aft wing spar lugs were separated due to impact. The entire wing structure was fragmented with rearward crushing along the entire length. The aft spar had crushed rearward into the flap and aileron, but the flap and aileron remained attached. The left wing tip was separated, and a portion of the tip was found hanging from a tree near the initial impact point. The forward wing strut was bent but remained attached to the fuselage and wing fittings. The straps that attached the strut to the wing structure were intact and still attached, but the wing structure that the straps attached to had been pulled from the remainder of the wing. The rear wing strut attachment eye at the fuselage was fractured during the impact. The welded fitting at the wing attachment end of the strut had separated due to impact. The separated end of the strut remained attached to the wing. The airplane's control system was examined to establish continuity. The rudder cables were intact from the forward seat rudder pedals to the rudder control surface. The elevator control continuity was confirmed by movement of both cockpit control sticks with corresponding movement of the elevator control surface. Aileron continuity was established by tracing of the control cable from the cockpit controls to the aileron control surfaces. There was an overload failure of the aileron balance cable within the left wing. With the exception of the break in the balance cable, the rest of the aileron control cables were intact. The flap control cable was traced from the flap handle in the cockpit to the surfaces with no breaks found. The flap return springs were in place and attached. The position of the flap control could not be determined due to extensive crushing damage in that area of the fuselage. No anomalies were found that would indicate a failure of the flight control systems. The airplane was recovered from the accident scene and transported to a facility for further examination of the engine. The propeller hub remained attached to the engine, and both propeller blade shanks remained attached to the hub. The propeller blades had a wood core with composite covering. Both blades were separated and splintered. The engine was removed from the firewall. The upper set of spark plugs were removed, and the valve rocker covers removed. The engine was free to rotate, and valve train continuity was confirmed by noting valve movement during rotation. Suction and compression were confirmed on all cylinders during rotation. The left magneto produced spark on all leads during engine rotation. The right magneto was not equipped with an impulse coupling and was removed from the engine. When rotated with an electric drill, the right magneto produced spark on all leads. The engine carburetor was broken loose from the engine and had impact damage to the mixture control arm. The carburetor was disassembled, and the fuel bowl was clean and free of debris. There was a small quantity of fuel remaining in the bowl. A test with water detecting paste showed that the fuel that remained in the bowl did not have any entrained water. American Forensics, Dallas, Texas performed an autopsy of the pilot. The pilot's death was attributed to injuries received in the accident. The Federal Aviation Administration Bioaeronautical Sciences Research Laboratory, Oklahoma City, Oklahoma, performed toxicology testing on the pilot's specimens. Testing results were negative for all substances in the screening profile. On October 28, 2016, about 1845 central daylight time, an Aviat model A-1C-180 "Husky", N377MA, was destroyed when it impacted trees and terrain while approaching to land at a private airstrip near Clarksville, Texas. The pilot, who was the sole occupant, was fatally injured. The aircraft was registered to ACME Husky, LLC, and operated by the pilot under the provisions of 14 Code of Federal Regulations Part 91 as a personal flight Visual meteorological conditions prevailed for the flight, which was not on a flight plan. The flight originated from the McCurtain County Regional Airport (4O4), Idabel, Oklahoma, at an unconfirmed time. The airplane was reportedly landing on a private airstrip. The airstrip's runway was oriented about 60/240 degrees and measured about 2,900 feet in length and 75 feet wide. The airplane came to rest about 2,100 feet from the approach end of runway 24, and about 250 feet left of the extended runway centerline. The airplane came to rest in a wooded area with the fuselage oriented in a 135-degree direction. 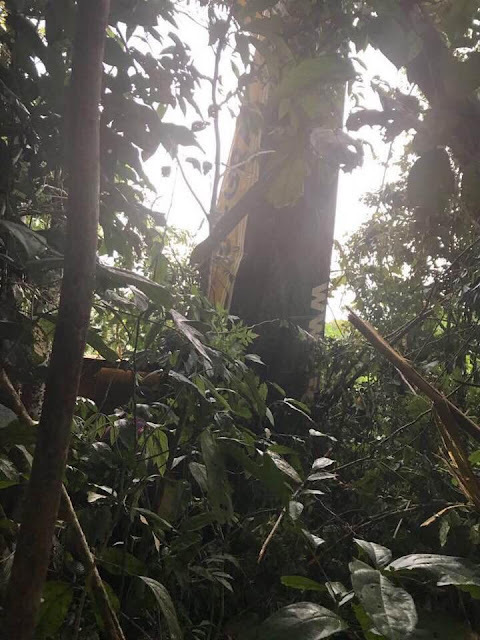 There were multiple broken branches from trees southeast of the main wreckage, indicating that the direction of travel at the time of impact was about 330 degrees. The base of the tree that was first struck was about 50 feet from the main wreckage.